An image of RPC-074 during the Winter War. Containment Protocols: RPC-074 is to be contained in a magnetically locked standard containment cell within Site-07. Two security personnel must be stationed outside of the cell and shifts are to change every six hours. Security operatives are required to be in groups of four and re-contain RPC-074 in the event of a containment breach. Should RPC-074 become defensively hostile, operatives must find cover. Description: RPC-074 is a humanoid entity with snowy-white skin pigmentation. The anomaly is mute and is unable to communicate vocally. Facial features cannot be determined as the anomaly is always covered by a mask. When personnel attempted to lift the mask, they were struck with intense wind and snow emanating from the anomaly. Temperatures within the room instantly dropped to -123° Celsius, causing severe frostbite and other deliberating effects. RPC-074 exhibits strength and durability well in excess of normal human limits and is immune to any sedative effects administered. The entity can also move through or between snow and ice at will, and has been observed to "phase into" or "rise out of" patches of snow or ice suddenly and with little warning, and is shown to leave no tracks or traces of its presence behind. While RPC-074 has been observed to be less active during daylight, it has attempted several times to escape from the containment cell at nightfall. During Incident-074-01, in which a power outage had occurred, the entity escaped from its containment cell within three minutes of activating emergency power. RPC-074 was discovered during the midst of The Winter War. Visual reports of RPC-074 stemmed from Finnish soldiers during the Battle of Kollaa, but no one could properly identify it. The entity has also displayed high resilience and survivability witnessed by containment operatives after evading carpet bombing through its phasing ability and having survived an explosive 7.62 x 54R without any indication of damage. There had been no report of any entity matching the description of RPC-074 prior to The Winter War. 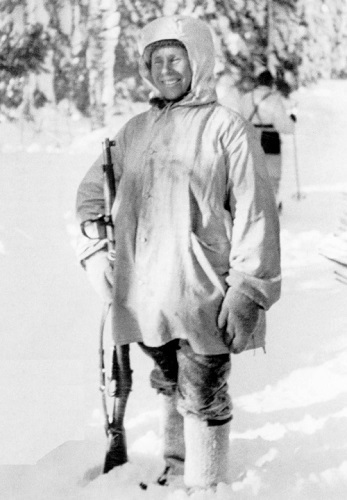 Though there had been previous accounts of folk talk from delirious injured Finnish hunters being rescued by a pale man in a mask, dressed in white camouflage. It is uncertain if these reports have any correlation to RPC-074. Agent ████ █████ shortly after winning the hunting competition in the Viipuri Province. Agent ████ █████, an RPC Operative of the Finnish Authority branch, was integrated into the Finnish Army as a cover operative to replace the entity while containment teams worked behind the conflict for several weeks to contain RPC-074. 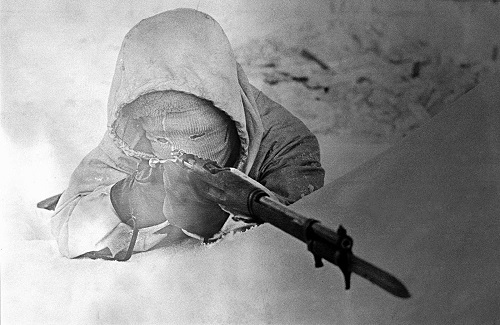 Given ████’s own successful hunting and rifle expertise, and the widespread support for the 'White Death,' ████ operated within the White Guard’s 6th Company of JR 34 as a sniper to cover RPC-074's presence. Reports of the anomaly's activities have been fabricated to better fit agent ████ into the role. Addendum-074-A: RPC-074's sapience calls into question its understanding of human concepts and behavior patterns. It has shown an understanding of demoralization and psychological warfare. I.E. butchering corpses of their ears, fingers and teeth as trophies and posing said corpses. While the anomaly has been observed to be dispassionate and cold, it has shown no signs of cruelty or malice. RPC-074 prefers to kill in a clean and proficient manner, removing targets as quickly as possible even before butchering. RPC-074 was not observed to attack or harm any non-Soviet personnel during its time in operation. Though TRT operatives were considerably injured during close combat with the anomaly. Despite its cold proficient killing and brutal defense techniques, RPC-074 shows elements of compassion and empathy. Finnish troops that were recovered after being declared MIA claim to have been rescued and medically attended to by a masked figure. Many who made these reports were said to be hallucinating due to pain and hypothermia. Though these reports do not contradict each other, and all share the same descriptions of the anomaly. Addendum-074-B: Several items were retrieved during RPC-074's initial recovery. However, a written scrap of paper was not found on the entity during containment processing. A Suomi KP/-31 Submachine gun. Bracelets are made of human teeth, fingers and ears.